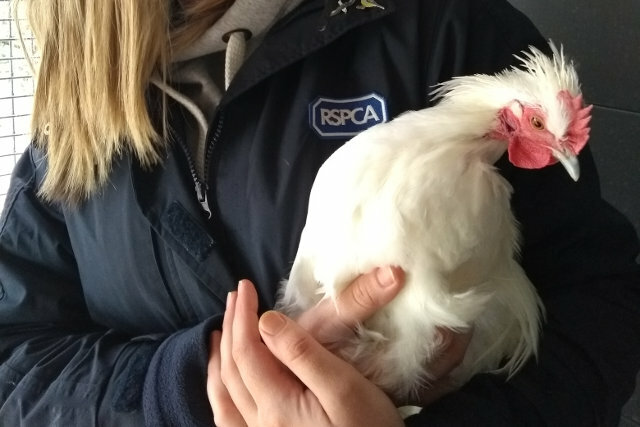 Cedric the cockerel was found by a road repair team alongside the dead chickens who had been dumped on the roadside. They spotted some movement among a pile of feathers and found Cedric was still alive and struggling among the mound of other dead birds. The road workers took him to the RSPCA Isle of Wight’s Godshill Animal Centre where he is recovering from his ordeal. The young cockerel is scrawny and has lost some of his feathers but is otherwise unharmed, and now looking for a home where he can enjoy his favourite treat – broccoli. “We’re really keen to see Cedric go to a loving new home and encourage anyone who thinks they can offer him the fantastic future he deserves after his upsetting ordeal to get in touch. The Isle of Wight branch of the RSPCA is a separately registered charity and is one of 164 charities that support the local work of the RSPCA. The team provide care and assistance to the animals on the Island that require help, and promote responsible animal ownership through local campaigns such as microchipping and neutering. For more information on Cedric – or to find out more about the others animals looking for homes at the Island’s RSPCA rescue centre – please call 01983 840287. RSPCA Isle of Wight’s Godshill Animal Centre is open every day, except Monday, between 11am and 4pm.